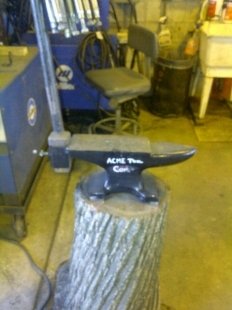 Homemade anvil modification consisting of a section of square steel tubing welded to the end. Intended to function as a convenient mounting point for an interchangeable set of bending jigs, each attached to a piece of 2x2 to fit the welded fixture. An interesting modification, one I haven't seen before.